Deliciously fresh fruity jammy made absolutely from scratch, in a natural way. Chia seeds, another goodness which not only helps to thicken the jam naturally (chia seeds would swell in liquid substances), it provides healthy elements such as plant base omega 3, omega 6, dietary fiber, protein, calcium, and more. The thing is, chia seeds will never affect the taste of the blueberry jam in any way. It’s tasteless. Yes, it’s indeed a superfood! (1) Soak blueberries for 15 minutes, drain well and pat dry. Place all amount into a pot, and add caster sugar, coat well. Bring pot to cook on stove over medium-low fire. (2) Mash the blueberries with a masher while simmering. When the fruits start sizzling, add black sugar, continue to simmer. (3) Blueberries will start releasing juices and turn watery in pot. Let it simmer until the juice reduces and thickens, for about 5 – 8 minutes. Stir occasionally. (4) Add lemon juice and stir well to combine. Let it further thicken till consistency turn viscous. Stir in chia seed. Heat off. Store jam in a sterilized glass container with lid tightened. Turn the container up side down to cool. 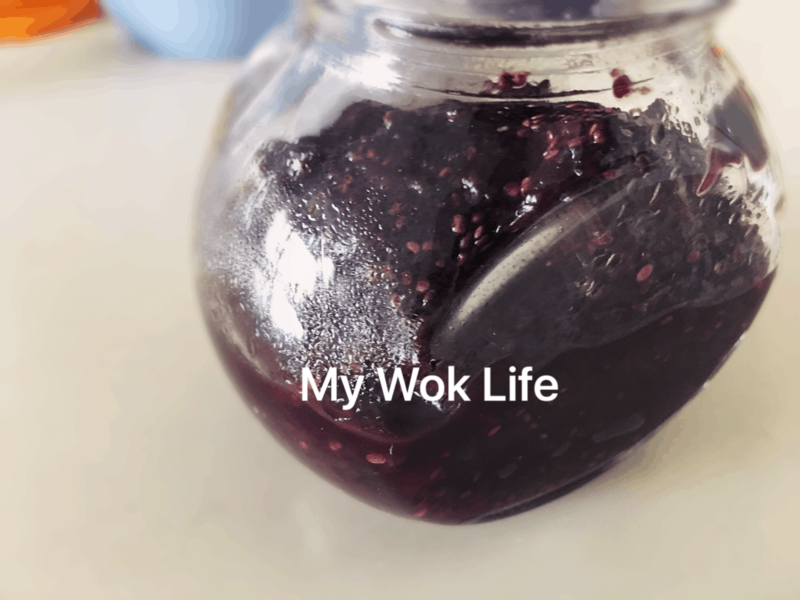 (5) It’s ok if the consistency still too watery for jam paste as it will thicken to jam-like paste when chia seeds swell up and the jam cools down completely. Store in refrigerator. 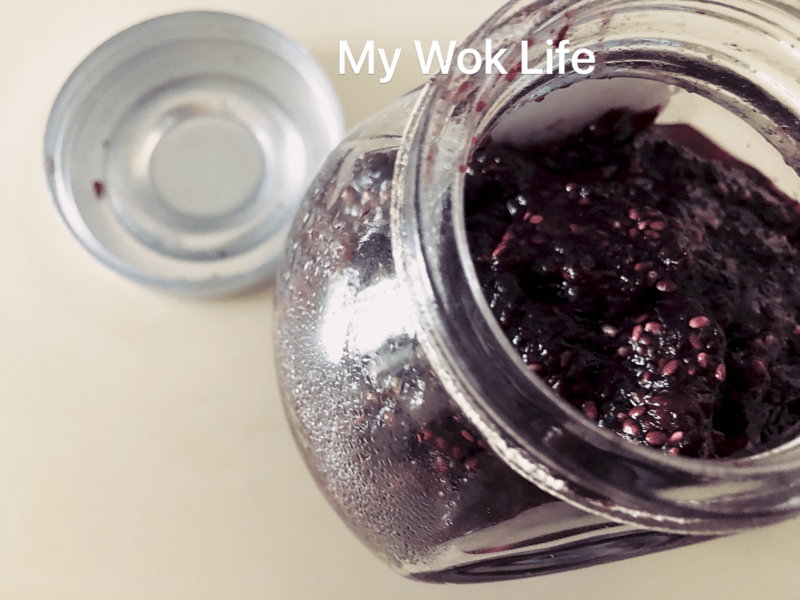 A tablespoon of my blueberry chia seed jam counts about 15kcal. Note: How to sterilize glass container? Wash the glass container with soap as per usual. Rinse thoroughly and dry with clean cloth. Put glass container into preheated oven at 160deg Celsius for about 15 minutes. Remember to remove any rubbery and plastic parts on the glass container before heating it in the hot oven. Glass has to be oven-proof/ heat proof, too. 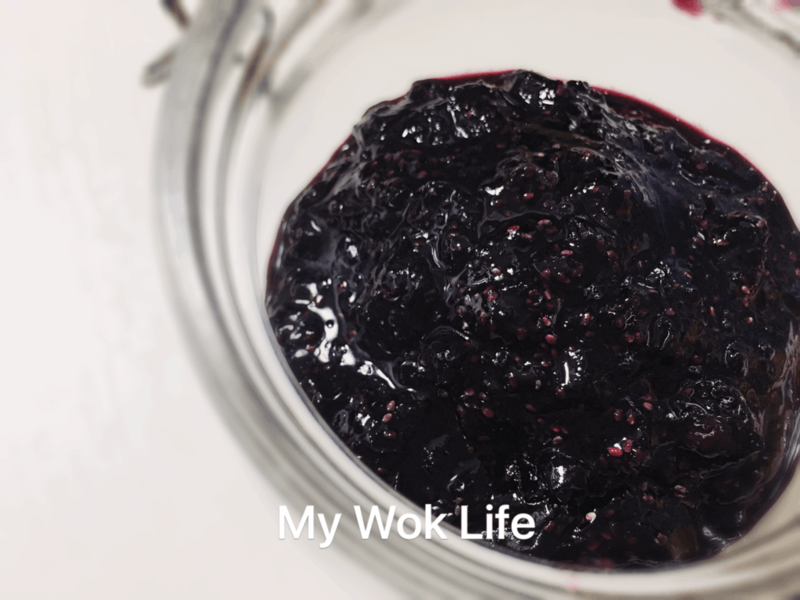 Tips: My version of blueberry jam wasn’t as sweet as the commercial ones. Adjust the sweetness to your liking. For sweeter taste, increase caster sugar to 2 tablespoons instead. * Chia seeds are available in major supermarkets and organic stores as well as online purchases. * Black sugar is not really brown sugar in Asia. Black sugar is popular among countries like Taiwan, Japan and Singapore. In any case, if black sugar is not available. Brown sugar or simply use the white sugar will be fine. * Glass bottles and containers widely available at IKEA and baking supplies stores. Love your site here Patrica. I’ve shared your Luncheon Meat recipe to my Facebook page and hopefully people will take a look at your site. I will be a follower from now on. Thank you, Dave. For your kind words. Thanks for joining me.